A public blessing and dedication ceremony this week celebrated the opening of a new playground at Waiakea Uka Park. Preschoolers from nearby Hale Aloha Nazarene School were the first to enjoy the new facility. Mayor Billy Kenoi, County Councilman Dennis “Fresh” Onishi and Department of Parks and Recreation Director Clayton Honma were among the dignitaries attending the opening of the new playground. 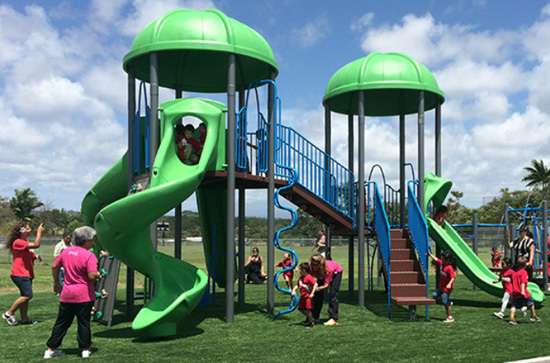 The modular playground features multiple slides, climbing rings, covered decks and a grass-like safety surface. Three benches, safety fencing and drainage improvements also are part of the $225,000 project built by IPR Inc. and Loeffler Construction. Replacement playgrounds also are being installed at Kailua Park in Kona and Hilo’s Gilbert Carvalho Park. When completed in the coming months, those projects will boost the county’s investment in keiki playgrounds to more than $3 million in less than six years.